Enter your email address below to receive a notification when Retro Game Treasure starts accepting new sign-ups! Enter your email address below to receive a notification when Retro Game Treasure is accepting new sign-ups again. Your box will ship on the 22nd of every month. Please order by the 21st of the previous month to get the current box. You will receive your box 4 - 6 business days from shipping. Do you have a game collection that you can't stop adding to? Then Retro Game is perfect for you! 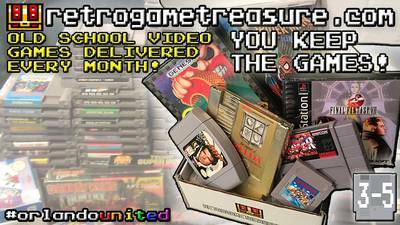 Get a treasure chest full of classic video games delivered right to your door! Every month you'll get a selection of games for the retro consoles you select. Pick your consoles, set your preferences, add to your wishlist! Start or build your Retro Game Collection! Cleaned and ready to play when they arrive! I always get something good no matter what. Of course I am not picky either. They have been spot on with my wishlist, they do also state for people that have more rare games on the list might not get them. They have had great communication skills with me. Thanks again retro game treasure! My wife got this for me for Christmas and I got my first box at the end of December. Loved it. A variety of games, and no junk. I was able to enter what games I allready had and what systems I wanted games from. I like the ability to tell them what I have and what I don't want (like sports games). Sure, it's a little expensive and I don't think the games I got are worth as much- but I'm a gamer not a seller. I feel this is a great service from people who obviously love games. I have three months and may even stay on and get more. I like the anticipation and suprise every month. I play the games and see myself using the cool treasure box to store controllers and junk. Would recomend this to someone who loves to play games and loves some suprise in their life. Not for people looking to resell or make a buck on games, go to Goodwill for cheap finds, this service is for people who play and want to be introduced to new games they missed by folks who know games. Wow. My partner loved it. Super excited to get more boxes. This box exceeded my expectations. I got some great games I hadn't tried before. Loved everything inside the box! Husband at first had low expectations, but was very surprised by what he received. He was a lot like a kid in a candy store. Will definitely continue his subscription. The games inside were all ones we have never had/or remembered playing them as kids. He loved the box it all came in, it fits the subscription perfectly! Shipping was quick and everything inside was packed perfectly. Thank you guys so much! RetroGameTreasure is a great source for curated games for a wide range classic consoles. 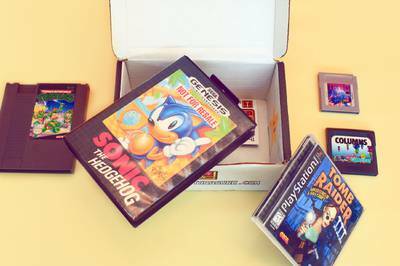 Gamers who are just starting to build a collection will get the most out of the service, but even experienced collectors can be sent some gems they have missed. Customer service is also very good. Selection -- RGT stocks games ranging from Atari 2600 to Dreamcast/GameCube/PlayStation 2/XBox, including mobile game systems. You have to choose a minimum of 2 systems and 4 game genres, however, so RGT isn't for single-system or single-genre collectors. Customer Service -- Customer service is excellent. RGT keeps customers informed about shipping and tracking, as well as any shipping hiccups that may occur. Also, in the event that you receive a game that you've indicated you already own (as happened to me once), you are immediately sent a replacement. Everything is handled very professionally. Subscriptions can be paused for a month at a time, or canceled by emailing RGT. Finally, the boxes RGT ships in are very cute. Custom Games Service, so cool!! So awesome to have a way to get Classic games for the consoles I loved as a kid! You get some pretty neat options on personal settings and you can change them on the fly! Don't listen to the negative guys review, he probably didn't fill out his settings page right and these guys have great customer service! Sorry to hear you didn’t like a game Stephen! I see in your settings you had the “Fun Sports” category checked off, this includes games like Punch-Out & Mario Tennis, less sports, more fun! We have a separate Category “Real Sports” for games like Bases Loaded or Ice Hockey, that most people don’t ever want! I have so many memories of playing my n64 as a kid. Mario Kart with my friends. Exploring Ocarina of Time by myself. Finding all the alternate paths in Star Fox 64. Doing the sniping mission in Mission Impossible 100 times just because what else was I going to do with my time. So when I got my box in and it was filled with Ocarina of Time I almost wept with joy. Sure there's a filler game or two every month but it seems like they always try to put a gem in there. I approve!